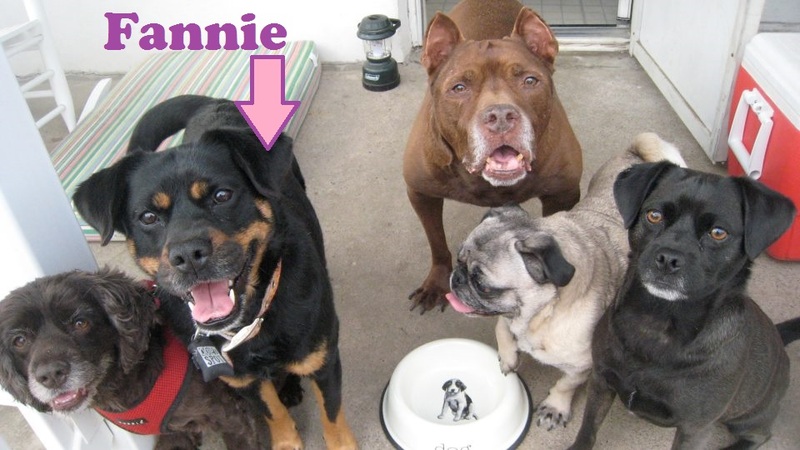 A few weeks ago I wrote about my dog Fannie in “The Fannie Test.” She’s a mutt, so whenever she does something awesome, she gets full credit instead of chalking her awesomeness up to her breed. There is no breed to chalk things up to. It’s all Fannie. Well, last week Fannie did something less-than-awesome. She hurt my other dog Martha. She hurt her pretty bad. Martha has ended up in Fannie’s mouth before so we decided a few years ago to just keep them separate. Our system of baby gates and door latches failed and Martha ended up in the backyard where Fannie was sunbathing. Fannie made a beeline for Martha and it wasn’t pretty and wasn’t a two-way street. 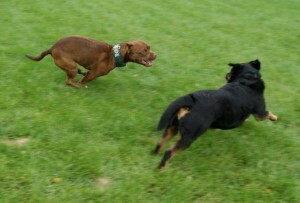 Fortunately our other dogs didn’t join in. By the time Fannie finally released her grip, Martha had severe puncture wounds and tears in her right shoulder and front limb. She spent the night in the ER and has been back daily ever since. Martha will be ok. 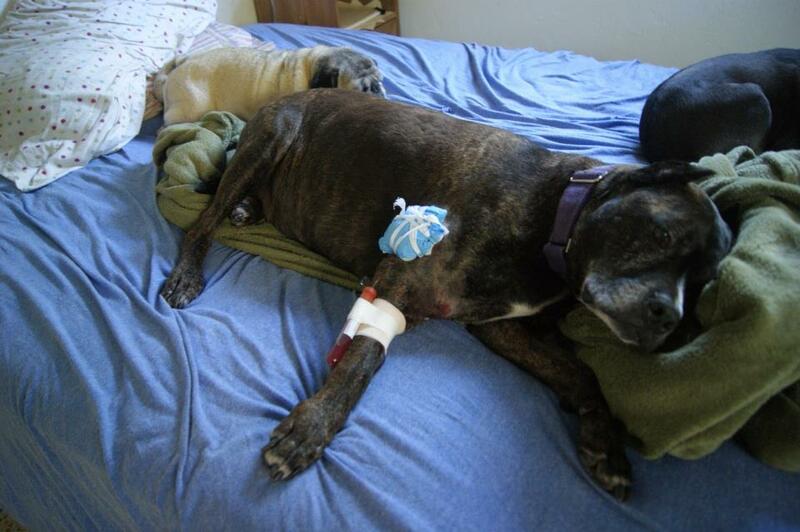 Her wounds are healing and her spirits are up. At this point our wallets are probably in more pain than she is. Now that the dust has settled, I’m thinking about “The Fannie Test” again. If Fannie were associated with a particular breed, my gut reaction would be to chalk up her actions to that breed — this time in a negative sense. We’re humans, it’s what we do. But I can’t do that here. There’s no breed to chalk it up to. I’m forced to view the situation through a lens other than breed. 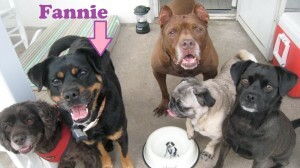 Had the situation been reversed, and Martha had nailed Fannie, people might attribute that to Martha being a pit bull. But that’d be just as useless as attributing Fannie’s behaviors to her being a mutt. Neither explanation offers any useful information, and neither explanation takes into account all the factors that contributed to the situation. I can’t/won’t speak for others, but for us having 6 dogs is tough, especially since 2 of them are kept separate. It’s a challenge we struggle with daily. It’s a ton of work and we’ve made huge sacrifices to keep our family together. With our skill sets, I don’t foresee Fannie ever coexisting with Martha. But Fannie is not dog-aggressive. 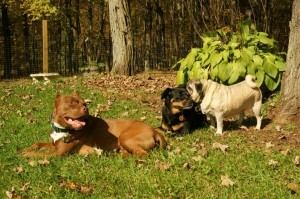 She does very well with our other dogs, both big and small, male and female, old and young. In fact, she’s the best thing that ever happened to Bug (pictured left and below). Bug loves rough and rowdy play and Fannie happily obliges! And our other dogs like Fannie, too — especially Mary Todd, who shares all her secrets with Fannie and uses her as a head rest. This past week has sucked, no doubt. But having dogs is not all roses and rainbows. Dogs are living beings, each with his/her own personality and quirks. Purebred or mixed-breed, they’re all individuals. 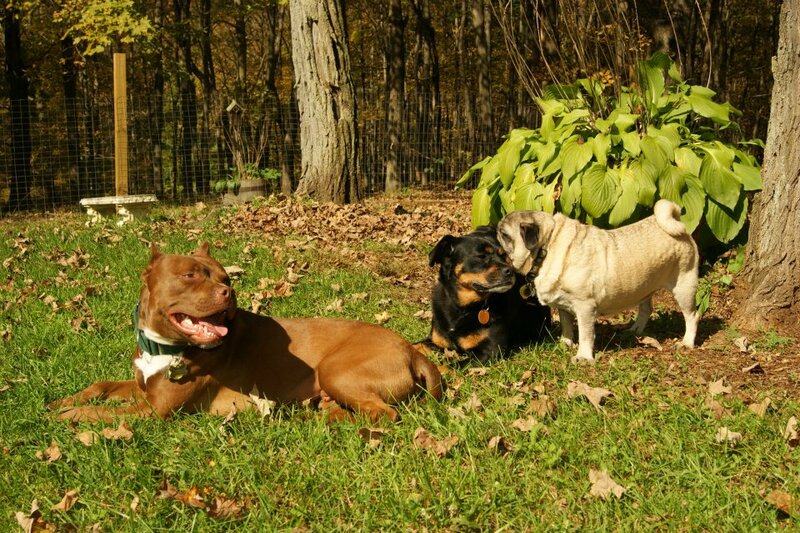 Whether our dogs are behaving in ways we like or acting in ways we loathe, they deserve to be understood as a combination of factors that makes each one unique — and that goes far beyond breed.